Calogero Pace first appears in the Painesville, Ohio, area about 1892 with his uncle, Rosolino Nasca. They was among the first Italians to live in Painesville. In America, Calogero Pace was known as Charles Pace. 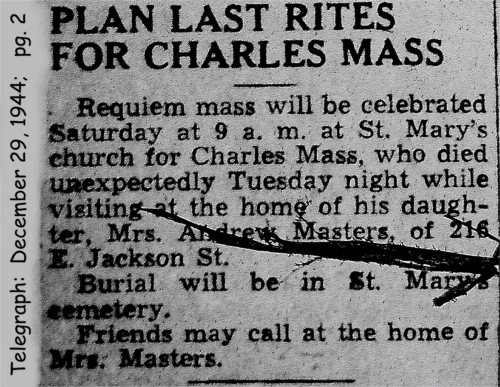 He was also known as Charles Mass, Charley Mass, and Charles Pace Mass. Calogero Pace, son of Rosario Pace and Maria Nasca, was born on December 5, 1875, at Montemaggiore Belsito, Sicily. He married Santina Cicero on February 17, 1901, at Buffalo, Erie County, New York. 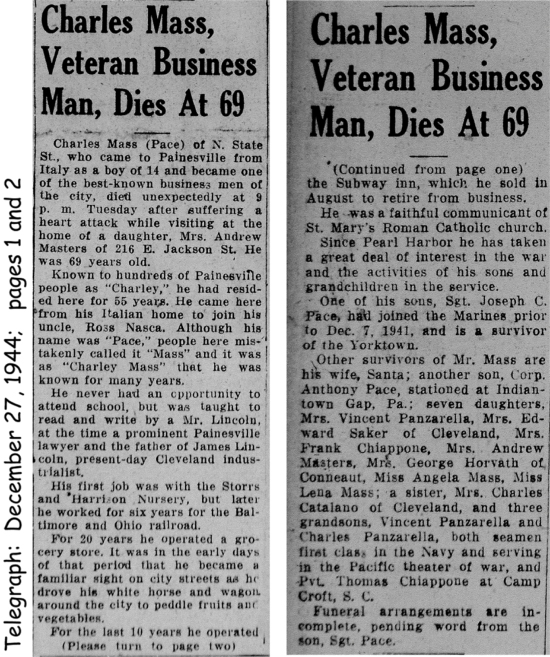 Calogero died on December 26, 1944, at 216 East Jackson Street, Painesville, Lake County, Ohio, at age 69, of a heart attack, at the home of his daughter, Josephine Masters. His body was interred at St. Mary Cemetery at Painesville Township, Lake County, Ohio. Calogero Pace, age 13, immigrated to the United States on March 25, 1889. Calogero first worked for the Storrs and Harrison Nursery in Painesville Township. He then worked for the Baltimore and Ohio Railroad for six years. For 20 years he operated a grocery store. For the last 10 years, he owned the Subway Inn. 1. Mary M. Pace was born on October 19, 1902, at Painesville, Lake County, Ohio. She married Innocenzo Panzarella, son of Vincenzo Panzarella and Santina Taravella, on October 7, 1922 at St Mary Catholic Church, Painesville, Lake County, Ohio. Mary died on October 14, 1979, at her home, 112 Palmer Avenue, Painesville, Lake County, Ohio, at age 76. Her body was interred at St. Mary Cemetery at Painesville Township, Lake County, Ohio. 2. Maruzza Pace was born on May 1, 1904, at Painesville, Lake County, Ohio. She married Dolore Saker, son of Saker T. Saker and Sadie Sheean, on September 21, 1936 at Lake County, Ohio. Maruzza died in 1951. Her body was interred at St. Mary Cemetery at Painesville Township, Lake County, Ohio. 3. Carmella C. Pace was born on May 22, 1906, at Painesville, Lake County, Ohio. She married Francesco Chiappone, son of Gaetano Chiappone and Angelina Pecoraro, on May 26, 1924 at St Mary Catholic Church, Painesville, Lake County, Ohio. Carmella died in 1962. Her body was interred at Riverside Cemetery at Painesville, Lake County, Ohio. 4. Josephine Pace was born on March 19, 1908, at Painesville, Lake County, Ohio. She married Andrew A. Masters. Josephine died on July 3, 1972, at Lake County Memorial Hospital, Painesville, Lake County, Ohio, at age 64. Her body was interred at Riverside Cemetery at Painesville, Lake County, Ohio. 5. Helena Pace was born on May 5, 1910, at Painesville, Lake County, Ohio. Helena died on October 28, 1965, at her brother’s (Anthony’s) home, Grand River, Lake County, Ohio, at age 55. Her body was interred at St. Mary Cemetery at Painesville Township, Lake County, Ohio. 6. Rosaro Pace was born on July 7, 1912, at Painesville, Lake County, Ohio. Rosaro died on November 11, 1921, at State Street, Painesville, Lake County, Ohio, at age 9. Rosaro died from convulsions following a tonsillectomy. His body was interred at St. Mary Cemetery at Painesville Township, Lake County, Ohio. 7. Joseph C. Pace was born on October 29, 1914, at Painesville, Lake County, Ohio. Joseph died on May 22, 1975, at Portsmouth, Virginia, at age 60. He lived in Painesville, Ohio, until 1943, then he moved to Portsmouth, Virginia. 8. Anthony J. 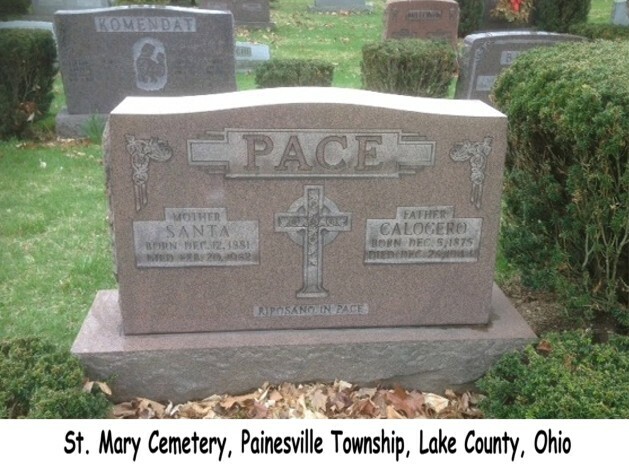 Pace was born on April 20, 1917, at Painesville, Lake County, Ohio. He married Mary Ann Farkas. Anthony died on May 27, 1995, at his home, at Ruskin, Florida, at age 78. His body was interred at Riverside Cemetery at Painesville, Lake County, Ohio. He had moved to Ruskin, Florida in 1994. 9. Angela M. Pace was born in 1919, at Ohio. She married Andy Galayda. Angela died in 1985. Her body was interred at Riverside Cemetery at Painesville, Lake County, Ohio. 10. Rose M. Pace was born on October 27, 1921, at Painesville, Lake County, Ohio. She married George D. Horvath. Rose died on March 9, 2001, at Painesville, Lake County, Ohio, at age 79. Her body was interred at Evergreen Cemetery at Painesville, Lake County, Ohio.